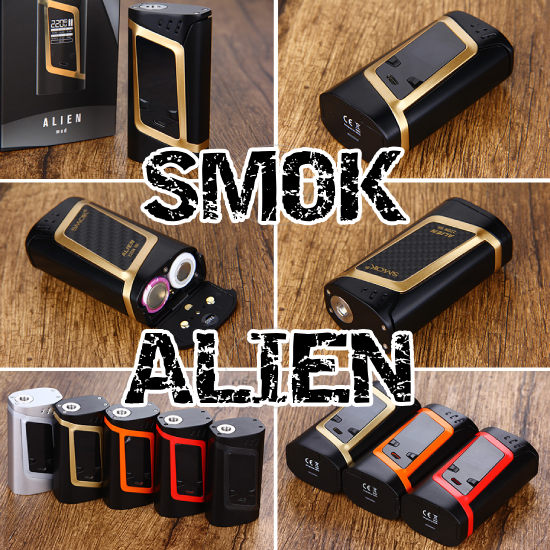 THE WORLD-RENOWNED SMOK ALIEN MOD BATTERY! The winner of the lottery #1236 for THE WORLD-RENOWNED SMOK ALIEN MOD BATTERY! was Jesus Lozano from Barcelona, Spain on Apr 11, 2019. Our sponsor WWW.ANTITPD.COM now carries NICOTINE SALT BASE, too! The SMOK Alien 220W TC Box Mod combines an ergonomic shape with stunning OLED display matrix alongside ample performance capability. Designed with futuristic elements in mind, the SMOK Alien implements a soft contour around the superior zinc alloy chassis, integrated with stunning colorful inlays for a striking output device. To throttle the device, a stealthy squeeze-to-fire mechanism enriches the ergonomic form factor, with intuitive placement of adjustment buttons to create a unique operation usage.The epicenter of functionality lies within the new OLED display matrix, providing extensive information within an easy-to-read operational interface. The chipset is notably intelligent, providing a wattage range of 6 to 220W, minimum atomizer resistance of 0.06ohm, and full temperature control suite with support for Ni200, Titanium, and Stainless Steel heating elements. Integrated within the internal onboard is a slews of safety features, including battery series connection. Built for robust workhorse capability within a beautifully constructed chassis, the SMOK Alien 220W TC Box Mod is truly out of this world.